“What?? ?” I said in disbelief that he would cut me off at such an important moment. “You’re going about this all wrong. The answer is right in front of you,” he said as he forked another bite into his mouth. “No, right in front of you,” still chewing. I looked down to where he was pointing. 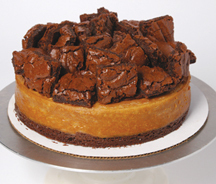 A Vegan Treats Brownie Chunk Cheesecake? Yes, he was implying that the concoction of soy, sugar, chocolate and deliciousness was my answer to saving the world—or at least effectively creating change in the future. He was advocating a seeing-is-believing approach. I got it. If this professor of history and politics of media and culture at New York University, a radical cultural studies wiz, was telling me vegan cake was the answer, I thought I should listen. It was then at my colloquium, my culmination of studies for my bachelor’s degree at NYU, that I realized I had been going about it all wrong. I had tools at my disposal to change minds, open hearts, create a difference, but my nose was stuck in the books and behind a computer screen. Professor Stephen Duncombe was sick of being talked at—hearing the relationship between classic text and the media, and how to change the world. He saw the cheesecake I brought as a snack during the two-hour evaluation as the answer. So at Satya I tried to put it to the test. In every issue for the past two years I have tried to communicate the appeal and importance of vegan cake and other treats. Through reviews of restaurants and bakeries, and interviews with people trying to gain believers through yummy food, I tried to convey the importance of what I think is one of the best ways to reach people. It seems that if people aren’t directly related to the horrors of their diet or the destruction of the world and the environment, they will wait for someone else to take action. If confronted, if forced to make a change with their diet, they make the change if they know they will benefit. Tell them about great-tasting cruelty-free sweets that they will seek again, and you have someone inadvertently caring about animal rights issues. And as they go back and learn about cholesterol, heart disease, added antibiotics and chemicals—everything that comes from eating the animal stuff—they begin to tell other friends, do their own research, and change their habits. And where their morning routine used to include Dunkin, it now includes vegan scones, their McDonald’s lunch is now chick-free Boca sandwiches, and so on. Aside from gaining positive reactions from people who read the reviews in Satya and try the new ice cream flavor or veggie restaurant in town, I also see the results in the diners themselves. Working part-time for over three years at popular West Village soul vegetarian restaurant, Red Bamboo, I know the approach is to go through the stomach. Duncombe was right. With nearly 75 percent or more of Red Bamboo’s customers being neither vegan nor vegetarian—but just plain liking the food—hundreds of thousands of lives are saved on a daily basis just through those customers I serve. People come back for the Creole Soul Chicken, the Cajun Fried Shrimp and the Butterfly Soy Chops, knowing that soybeans are the victims, not chickens, shrimps or pigs. And they do it because it tastes good. Where I tried to fuse my passion in writing and editing with this dynamic tactic at creating believers of the cruelty-free diet, Satya’s end shows me that I must travel on the path to the sure-fire bet. I turn to the Brownie Chunk Cheesecake and let its inspiration guide me to my next calling: convince as many people as possible that veganism tastes good…so just do it. I say, let them eat cake…and brownies, donuts, sticky buns, anything sweet, as long as it is so good it shows people how easy and tasty vegan can be. Just you wait, vegan food will help take over the world. Circulation Manager for Satya, Maureen C. Wyse wears many hats. Coordinating events, writing, editing and being on the look out for delicious vegan food, she believes in the power of the written word (and food) to help change minds and hearts.